Maggie Puckett, InterArts Book and Paper MFA (2011) expected to have her artists’ book Homeland on display during entire run of the Printed Matter Book Art Fair in Los Angeles February 1–3. But Occidental College Special Collections in Los Angeles decided to purchase the work the night before the opening, which was held at The Geffen Contemporary at MOCA. Homeland is an homage to the land and sea of Southern California, utilizing handmade paper to traverse the region from arid inland desert, over wooded mountain, through chaparral, grassland, and sage scrub towards the coastal shore, from shallow water kelp forest to deep sea canyons. Pigments and inclusions of found natural materials turn pages of the book into representations of a corresponding habitat. Puckett made use of locally found desert agave, desert sand, soil, charcoal, grass, cattail, seaweed, and lobster shell, along with other fibers and pigments, to create the tactile and informative piece. 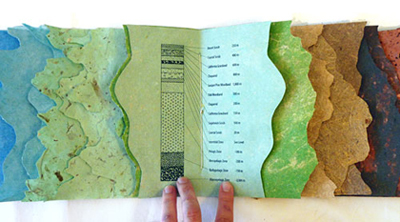 The book’s handmade paper was formed at CBPA during 2010–2012, and the finished piece was assembled and bound in Southern California over this past winter. To see the work and more about the artist, click here.